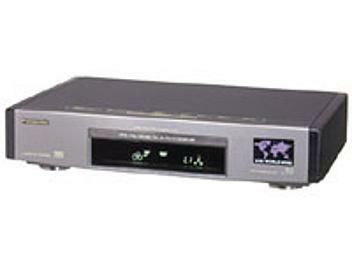 Playback and record in all TV Broadcasting Systems (NTSC, PAL, SECAM). Multi-function remote control with variable slow motion and jog/shuttle search. Hi-Fi audio and narrative recording. Selectable 6-language on-screen menu (English, German, French, Spanish, Italian, Japanese). Simplified quasi playback of S-VHS tapes.